For the second year in a row, Harrogate has been named as the happiest place to live in the UK by the property website Rightmove. The annual nationwide study ‘Happy at Home Index 2014’ asked 40,000 members of the British public for their opinions on their home, community and property. 12 factors were considered in total including property investment, community safety and recreation facilities among others. Overall 100 locations were evaluated in the study. Harrogate offers a wonderful environment for residents. The district has some of the most beautiful countryside in the UK, if no in Europe and beyond. There is also a great community feel which certainly makes life a lot happier for many people. Turkish Baths – dating back to the 19th Century. Royal Pump Room Museum – displays information about Harrogate’s history as a spa town. Betty’s Tea Rooms – famous for their afternoon tea and a popular well known landmark, prepare to queue if you want to visit! RHS Harlow Carr Gardens – landscaped gardens and tea rooms popular for families for days out. Yorke Arms Restaurant (Ramsgill) – a Michelin starred restaurant housed in a former coaching inn. 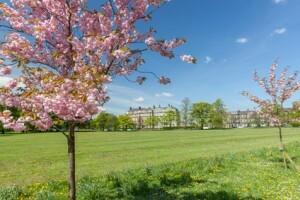 Harrogate also offers many cultural events throughout the year for its residents and for tourists / visitors including a writing festival and arts festivals. The average house price in Harrogate is £309,133 which is approximately £40,000 higher than the national average in the UK. The accolade of ‘Britain’s happiest place to live’ is a further boost to the Yorkshire region as last year it was named number 3 in Lonely Planet’s Top 3 regions in the world, behind Sikkim in India (1) and The Kimberley in Australia (2). Yorkshire has also won the World Travel Awards in 2013 for ‘Europe’s Leading Destination’ where it was recognised for its contribution to tourism. Yorkshire is due to host the Tour de France in July 2014 and has been recognised for its stunning landscape and scenery by the Cycling world.